Black Acer DA220HQL is an All-in-One 21.5 inch Full HD Touchscreen desktop with Android operating system: Both a massive tablet and a powerful desktop PC. The touchscreen is very easy to navigate with thousands of applications in different areas of interest. You can easily link your other desktop, laptop or tablets via the HDMI port and use it as a screen. 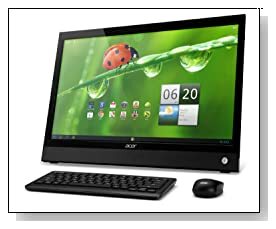 It is quite a versatile machine at a great price but let’s find out if it would be the right one for you..
Acer All-in-One has a dual core ARM Coretex-A9 Texas Instruments- TI OMAP 4430 processor at 1 GHz, 1GB DDR3 SDRAM, 8 GB Solid State Drive, MicroSD memory slot up to 32GB and Android 4.0 (Ice Cream Sandwich) operating system. Although these technical specs may seem a bit low in terms of memory and hard drive, remember this is not a Windows system and it operates quite differently. It is like a step up from what you may be used to on your Android phone or tablet. Small 1GB memory this machine comes with allows for smooth multitasking, it is fun to work with so many easily customisable applications and a few bits and pieces you simply can’t get on a Windows system. You get a large super slim profile 21.5 inch full high definition optical 16:9 aspect ratio touchscreen display with 1920 x 1080 pixel screen resolution and integrated graphics coprocessor offering very shape and clear images with fine details and pretty colors, great for multimedia apps and advanced HD stuff. It has the IPS technology that allows you to view the screen clearly from different angles- up to 178 degrees. It only enables 2-point multi-touch control rather than 5 or 10 but you can still swipe, pinch, tap and slide by simple touch of your fingers. The front facing webcam is 1.2 MP HD quality with very crisp video and ideal for Skype chats with friends and family or for still photos. The 20-70 degree ergonomic tilting angle display allows you to use touch functions more comfortably. This is an environmentally friendly monitor as it uses less energy and is mercury free. It also has two integrated speakers- 1 watt each for decent sound quality. Black Acer DA220HQL weighs just 10.6 pounds with dimensions of 23.70 x 2.23 x 14.15 inches- quite light and portable as a desktop. It comes with Wi-Fi 802.11 bgn wireless, Bluetooth 2.1+EDR, 10/100/1000 Gigabit Ethernet, Micro HDMI port, 2 x USB 3.0 ports, a micro USB 2.0 port with monitor touch-control input to PC, Media Card Reader, wireless keyboard and mouse, a micro SD card slot to be able to expand the storage space to 32GB. Google Now for up-to-date daily traffic, weather, train, sport etc. information, Google Play as a great single entertainment platform to find music, books, movies, applications on the internet. Then you have the Acer Ring for improved multitasking and easy access between things. Conclusion: Sleek and beautiful Acer DA220HQL All-in-One PC is one of the best value computers you can find on the market. It can act as a monitor for any kind of Windows machines, a rather big tablet and an All-in-One Android computer. Some customers seem to expect it to be a Windows installed system and criticise it for not being so, which is a bit unfair and they can still use it as a Full HD monitor to their Windows systems. One thing to note as a negative would be the 2-point touch function rather than 5 or more. The memory and hard drive sizes are not huge but suitable to this system- for what it is as an Android machine and for how much you are paying. The design is great, it has a nice wireless keyboard and a mouse as well as good range of connectivity options and things seem to be running smoothly, so a great entertainment centre at a very affordable price!